Park Ji-Sang(Ahn Jae-Hyun) is a doctor specialising in hepato-pancreato-biliary surgery in the best cancer research hospital in the country. He is also a vampire. Despite seeming cold and unfeeling, Ji-Sang masks his soft heart and inner pain and yearns for closeness with people. He believes very strongly in the sanctity of human life and suppresses his thirst for blood to treat terminally ill patients and save lives. Among his colleagues is Yoo Ri-Ta (Ku Hye-Sun), a hotshot physician who entered medical school at the age of 17 and is also the niece of the chaebol group chairman who owns the hospital. Ri-Ta is highly capable but snooty and prideful, yet Ji-Sang finds himself falling for her. He also gets drawn into a conflict between good and evil as he encounters Lee Jae-Wook (Ji Jin-Hee), a two-faced hospital director who gains everyone’s trust with his gentle demeanour but inwardly harbours a dangerous ambition for power and a talent for cruelty. I never intended to watch Blood to begin with. I found it by accident and asked about it to my sister. Apparently, she has watched it and according to her, this drama is not that bad if not because of the ending. Well, since she said it like that, I decided to watch it and yes, I totally agree with her. Blood has a good story but the downfall is because of the ending. Before I talk about the ending, let’s talk about the cast first. I have seen Ahn Jae-Hyun before in You’re All Surrounded (2014). Even though he’s not playing the main lead character, his character managed to attract the attention of the viewers. 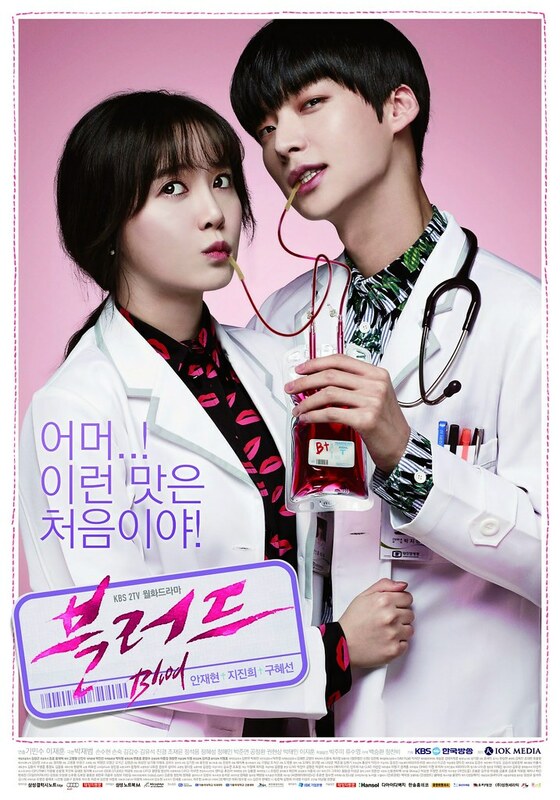 In Blood, Ahn Jae-Hyun got to play the main character, Park Ji-Sang, a genius doctor who happened to be a vampire. Quite remind of Carlisle Cullen in Twilight Saga actually. I thought the story would be somewhat weird and unrealistic. It’s still unrealistic but not in a bad way. The vampire thing is not because of some supernatural power in the universe but more of a disease. A virus, in this case. It’s not possible but more acceptable to understand. I read some reviews before and they said that Ahn Jae-Hyun’s acting is disappointing. He has no expression and looked very stiff. I have to agree to disagree. I mean, yes he looked expressionless but Ahn Jae-Hyun indeed supposed to be a cold vampire, therefore he mustn’t have shown too much emotion, isn’t he? He’s doing well in that department anyway. However, as his character started to fall in love with his fellow doctor, his personality got softened and Ahn Jae-Hyun did great in portraying it. Despite what other people think, I personally think he’s doing just fine. Ku Hye-Sun who played the role of Yoo Ri-Ta, did her part really well. She was very good in Angel Eyes (2014) and she’s still good in Blood, but somehow, there’s something off about it. I don’t know. Perhaps it’s just me, but I do like her more in Angel Eyes. However, her chemistry with Ahn Jae-Jyun is good. Not perfect but good enough. There are some moments happening between them but not quite as many as I was expected. On the other hands, I have to admit some moments are sweet and others are funny. It’s interesting to see when they were together. I didn’t recognise Ji Jin-Hee until my sister mentioned about him. I’ve seen him in Dae Jang-Geum (2003-2004). He looked so different without all those moustaches, but still doing a great job in portraying his character. For an antagonist, Ji Jin-Hee did a great job in expressing his emotions. His facial expressions were spot on. As Lee Jae-Wook, his relationship with Park Ji-Sang always made the viewers curious. Their history was unfolded little by little through the series. I was expecting their history would be eventually about something big. I was pretty disappointed when it turned out to be unclear. Even the closure of their problem is too easy and too uninteresting. Of all the characters in Blood, Joo Hyun-Woo played by Jung Hae-In, was the most refreshing one. Together with his robot, created by Joo Hyun-Woo, they managed to make a good laugh. Even the chemistry between Joo Hyun-Woo and Choi Soo-Eun, played by Jung Hye-Sung, was refreshing. Their story was light and gave us a little bit of entertainment in the midst of a thrilling situation. However, how their relationship turned out to be something unexpected and somewhat disappointing too. However, both Jung Hae-In and Jung Hye-Sung have portrayed the character really well. This is the not the first time I saw Jung Hae-In. I’ve seen him before in Reply 1988 (2015-2016) and Goblin: The Lonely and Great God (2016-2017), however in both dramas, he only played a very minor role. More like a cameo, if I have to say. In this drama, I am so glad that I got to see him more and he really made a good impression on me. His acting is good and entertaining. I heard he gained even more popular these days because of the newest drama When You Were Sleeping (2017), which I haven’t seen though I will see it soon. As for Jung Hye-Sung, I don’t really remember her in Remember: War of the Son (2015-2016), but in Moonlight Drawn by Clouds (2016), she got an interesting character, leaving good impressions on me as well. But before those roles in those dramas, Jung Hye-Sung apparently starred in Blood and she has executed the job really well. The robot named Luvvy in this drama is also super cute and super adorable. I think everyone loves it. I have so many disappointments when I watched Blood. I mean, not in the beginning, but in the last two episodes, I have many disappointments. I kind of understand what people have been saying about this drama. The biggest disappointment is, of course, the ending story of Blood. In the beginning, Blood has a very good start with a solid background story. The first few episodes were pretty much very exciting. The stories are good and I like how medical story combined with a little bit vampirism or some sorts. It did make things more interesting. However, as the story and episodes went by, the medical story lessening. The surgery reduces in a lot. I get it, really. It’s understandable since Blood isn’t entirely a medical drama like Doctors (2016) or Good Doctor (2013). Blood is, of course, a fantasy drama first. It’s really understandable but still, I can’t help feeling disappointed. As I was saying, Blood has a very good story as an overall. The main idea is strong. Vampire is not some sort of supernatural being but more a disease caused by a virus created by human. Up until that point, the plot is still interesting. They even made Park Ji-Sang’s case special because he’s not like any other ‘vampires’ who were infected and many people—vampires, to be exact—were interested in Park Ji-Sang. Lee Jae-Wook seemed very determined to pull Park Ji-Sang to his side. However, in the end, everything doesn’t matter. Everything seemed to be a waste because everything became unclear. Most likely, the writers got confused on how to make the ending that the story got bias and wild and unclear. Lee Jae-Wook’s purposes weren’t clear anymore. They were no longer consistent with their first purpose. I, myself, was confused about where the story was going to be taken and ended. It’s very disappointing, really. I was going to give it a good score but seeing how disappointing the ending is, my score for Blood was decreasing by the lot. It’s not how you start but it’s how you finish, so they say. However, this term doesn’t fit for Blood because the start of this drama is great but how they finished it is bad. It doesn’t matter how they gave good settings, good visual effect, good costume and makeup, or a good start, or even the fighting scenes, when the ending was bad, leaving the audience feeling disappointed and unsatisfied at all. I give Blood 7 out of 10 stars.